My little family has had a lot of adventures, Moose & the Bean are getting so big and I’ve quilled a ton of paper! For my last post of the year, I thought I’d focus on some New Year’s Eve decorations and the first thing that popped into my head was bright, metallic stars. 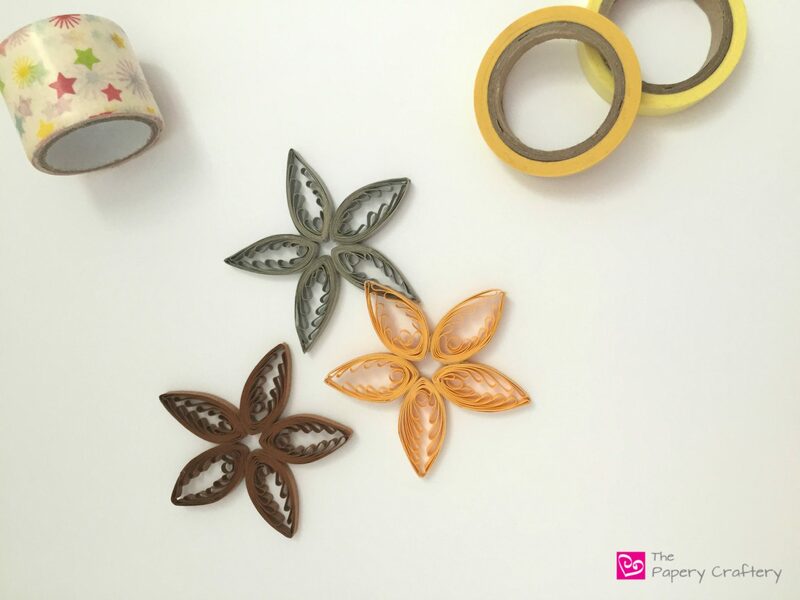 So break out your favorite shiny strips and let’s make some quilling paper stars! Since my quilling comb was still sitting out on my work table after using it in my recent post about poinsettia plants, I decided to use it again on these stars. But, because the quilling tool is an amazingly handy thing to have around, I’m switching up the way I’m using it this week and showing a different method. The metallic strips I’m using are from Paplin. I like their copper and brass strips a lot. They are extremely long, which is perfect for the size stars I’m making. The gold in this series is a little dull for my liking, so I choose the yellowish gold from the Quilled Creations Holiday Mixed Colors pack. These are a little bit shorter in length, so to make the same size stars I’m showing, you’ll have to glue two strips end to end. First step is to roll one end of your strip on your needle tool. Remove it from your tool and place the loop that was made on one of the center spikes of your quilling comb. This will make a nice anchor to keep your strip right where you want it on your comb. No glue is needed at this point ~ it will stay just fine! After the first coil is on the center pin, pull the strip to the front of the comb and wrap it around the pin right next to the center. Pull the strip to the back of the comb again. Bring it to the front of the pin on the other side of the center loop. Loop it around and to the back again. Keep looping your strip around the pins on your comb, going one further out from the center each time. Weave back and forth on either side of the center coil until there are 6 loops on either side. The goal is to have all the loops on one side of the comb and the other side will be flat. Once all the loops have been made, gently slide the quilling paper off the comb. This may be a little tricky the first few times, especially if you’ve weaved your strips really tightly. Just take your time and pull evenly. With the strip off the comb, gently bend at the center so the loops are facing the inside and wrap the whole shape with the remaining paper tail. I like to wrap it around twice. Tear excess and glue to keep together. If some of your loops have gotten a bit wanky, use your needle tool to fix them. Give a slight pinch at the bottom. Repeat 4 more times for a complete star. Glue all 5 together at the pinched end. To make these really special, add some smaller combed shapes for a 3-dimensional star. On this quilling paper star, I wrapped shorter paper strips around my comb in the same way, but only looping 4 on each side of the center instead of 6. I also added a dome rolled from an 8″ strip to help them stand up a bit. I used a dab of quick-drying Tacky Glue to help them stand up a bit on the original star. Try another variation by adding two tones or stripes with the technique I shared in this post about quilled shamrocks. Or maybe some monochromatic decorations with stars in white, silver and icy blue. Add some ribbon and hang them as a quilling paper garland or make a few to hand out as DIY ornament gifts next Christmas. I hope you’ll find some time to quill a few of these shiny stars before the New Year, but if not, pin it for next year! I’m going to take a week or two off so this is my last post for 2017, but I truly want to thank all of you lovely people for all your kind thoughts, comments, and emails that you’ve sent my way this year. You’ve all inspired me and motivated me to keep quilling and sharing my ideas and I have so much more to come! From my family to yours, I wish you all very Happy Holidays and a wonderful New Year! See you in 2018! Kathe, thank you so much ~ you’ve made my day! I’m so glad you’re finding it useful!